If you have to do a lot of work on a computer, or even if you use one a lot at home, most likely there are cables and other “necessary evils” cluttering up your desk. You might not be able to eliminate the scourge of cables from your life completely, but you can at least keep them under control. 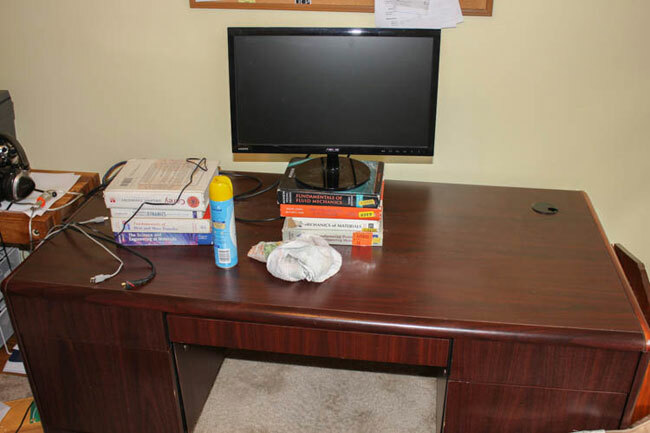 Though I could try to defend my formerly messy desk, there are a number of benefits to keeping things clean and organized, even if you’re not going to offend higher-ups. Being able to place papers next to your computer and find things can contribute to your efficiency, and keeping things clean can certainly contribute to a relaxing and healthy work environment. The desk now looks clean, though the rest of the room may not! 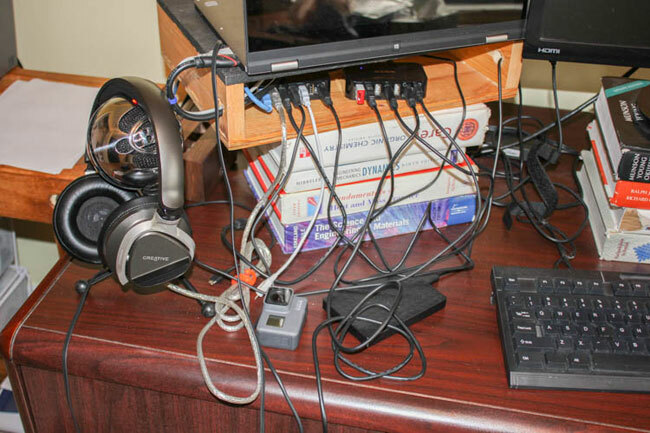 If you do decide to organize things, you could just loop a few cables together and call it a day. On the other hand, if you’re going to make an effort to get organized, you might as well go “all in” and clean up your desk entirely. In my case, my desk wasn’t at the “bad example” point, but it did need a good tidying and some general organization effort. I decided to start from scratch. I took everything off my desk, making the rest of the room decidedly messier. This gave me a chance to dust everything off and consider where things should go. It seems that items build up in random desk spaces that don’t necessarily fit into your flow well but were simply placed in a space available at the time. 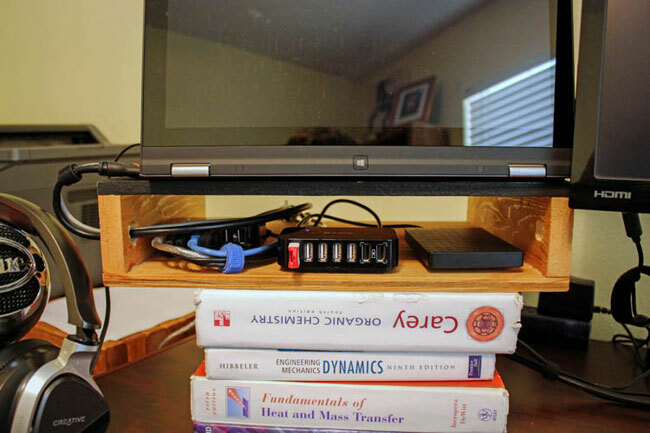 After cleaning things off, I replaced my homemade wooden computer stand on top of the various engineering books that I thought would be useful after engineering school (though not as a very expensive computer stand) and put my USB hubs back in place. This time, however, they would be kept in place with VELCRO® Brand industrial-strength tape. I cut up two pieces to a size that would fit my hubs well, then attached them to the notebook stand and the USB hubs. I positioned things much as they were before. Now, however, I could plug in peripherals without worrying about my hubs sliding around. 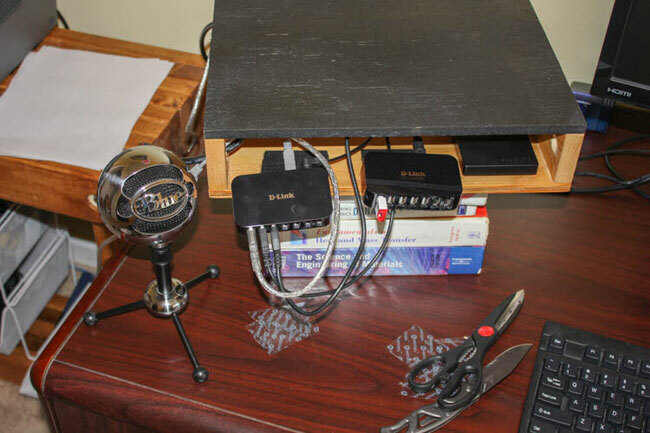 I also secured my external hard drive in a similar manner, moving it off my desk and next to one of these hubs. Cord organization still a work in progress at this point. In my computer setup, I have one USB cable going to my notebook computer, then into a hub, which is then connected to several peripherals that I almost never disconnect (like my keyboard and printer). I decided to re-position this first hub slightly under my computer to keep these never-disconnected cords from poking out too much. The second, which I use to plug in removable peripherals like my phone I kept near the front of my support box for easy access. I fastened all the recessed cables together with a blue color-coded strap, then sent them on their way to do their electrical magic. A few other straps hold my wiring together as it makes sense, keeping it contained. Besides USB, several other cables could be bundled together, such as my monitor’s HDMI cable along with its power cord, and a USB and power cable from my printer. Finally, I have my HDMI and USB connector that go into my computer attached closely together, eliminating much of my fumbling around for these connectors when I need to connect it. Power hub and other accessories now secured. 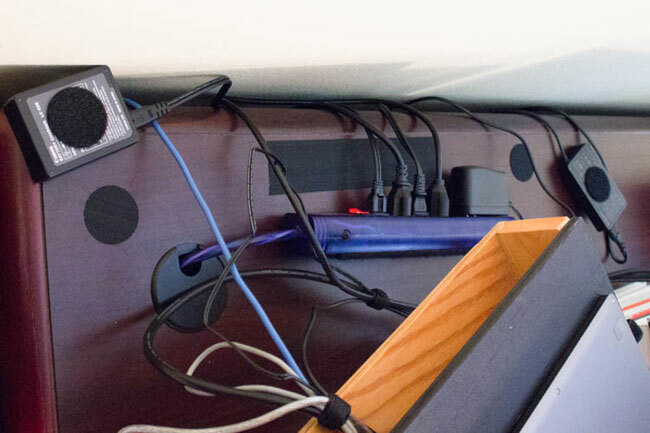 Though USB and other cables are a large source of clutter, they’re not the only electronics floating around on my desk. 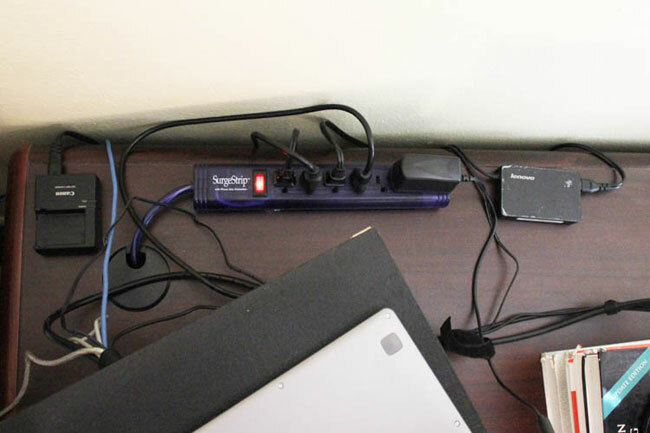 The next most obvious offender was my power hub, which could often be found lying on its side toward the back of my desk. This was easy enough to fix. I simply cut another strip of industrial strength tape to the length I needed, then attached it to the bottom of the hub. I attached the corresponding hook strip to the desk, and now it stays in place with its sockets facing the ceiling. My battery charger now has a home, fastened down with VELCRO® Brand coins in a similar manner to my USB hubs and hard drive. My laptop’s power connector is attached in the same way. The coins were quite easy to use since I didn’t have to cut them to size. 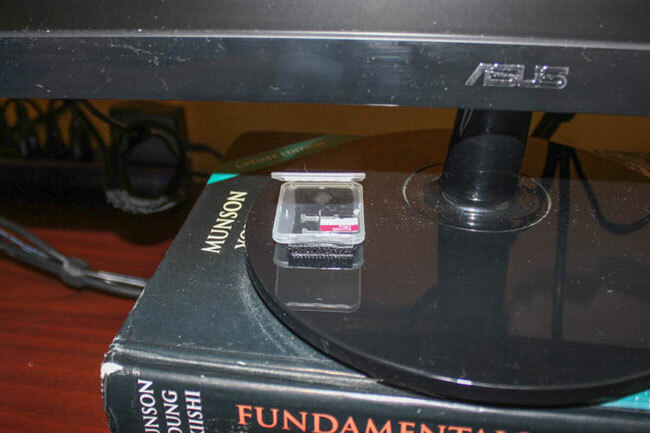 Tiny, but quite important, my micro SD cards now have a set resting place. Finally, I have a small case for my tiny micro SD cards that could easily be lost. I attached this to the base of my monitor with another cut piece of industrial strength tape, making a permanent place for these guys when they’re not in use. 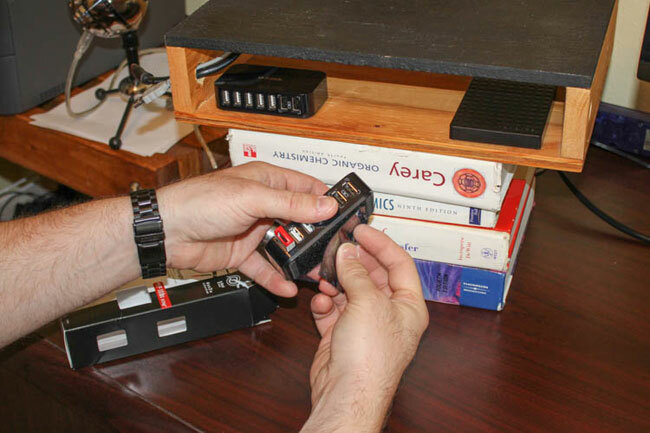 This same type of attachment method could be used to hold other devices as needed—perhaps even in a discreet location behind a monitor, or on the top of a drawer to restrict access as needed. After quite a bit of work, my cables look much neater. Now that my desk was clean and organized, things felt and looked much better. Noticeably brighter, in fact. As I soon found out, that last observation was mostly due to me plugging in more lights to properly photograph my work. However, after going back to my normal meager lighting, things do look a bit brighter and more open. At least there aren’t as many wires and other items living on and around my desk! Jeremy Cook is an engineer and an avid maker and experimenter who writes for The Home Depot. He loves to tinker and build things, from a paint station in the garage to a home office organizational system using VELCRO® Brand hook and loop fasteners.